The viewers who had receives invitations (10 persons) gathered on station Lobnya and were met by one of participants of the action (estimated time of travel by train – 40 minutes). 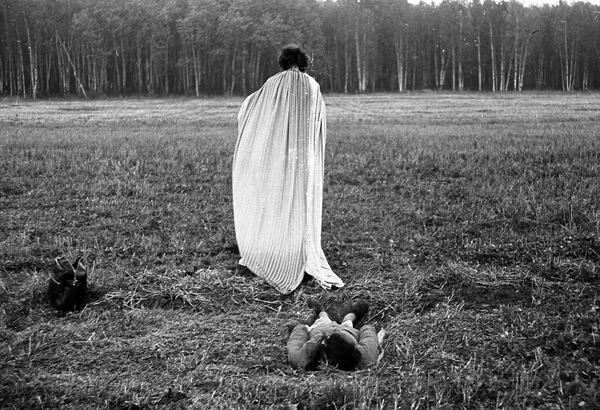 After reaching village Kyevy Gorky by shuttle bus (estimated time – 20 minutes) and crossing the forest (10 minutes), the audience found itself on one side of a field. Two other participants appeared on its opposite side. One of them, who was noticeably taller, wore a long loose ochroid robe. The other participant in casual clothes went behind him, carrying the tails of the robe. When the distance between them and the audience reduced to 80 meters, the man in the robe stopped, facing the audience. The other one in casual clothes crawled under the overall and in such way they proceeded towards the audience. 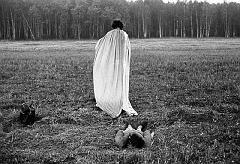 When they were 25 meters away from the viewers, the robed participant lifted the robe’s tail and it became clear that the second one had been gone. Then the first participant turned right and disappeared in the forest. Moscow region, Savyolovskaya railway line, field near village Kyevy Gorky. A. Monastyrski, V. Miturich-Khlebnikova, N. Panitkov, N. Alexeev.